I now come to one whose entire dramatic career I have been able to follow – the best talent the Opéra-Comique had to show, Mme. Dugazon. Never has such reality been seen upon the stage. 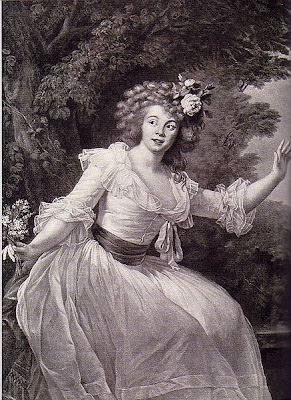 The actress disappeared, and gave place to the actual Babet, Countess d’Albert, or Nicolette. Her voice was rather weak, but it was strong enough for laughter, for tears, for all situations, for all parts. Grétry and Delayrac, who wrote for her, were mad about her. No one ever again played Nina like her – Nina, so decent and so passionate at once, and so unhappy and so touching that the mere sight of her made the audience shed tears. Mme. Dugazon was a royalist, heart and soul. Of this she gave the public a proof, when the Revolution was well advanced, in playing the part of the maid in “Unforeseen Events.” The Queen was witnessing the performance, and in a duet begun by the valet, with “I love my master dearly,” Mme. Dugazon, whose answer was “Ah, how I love my mistress!” turned toward the Queen’s box, laid her hand over her heart, and sang her reply in a melting voice while she bowed to Her Majesty. I was told that the public – and such a public – afterward sought revenge by attempting to make her sing some horrible thing which had come into vogue and was often heard in the theatres. But Mme. Dugazon would not yield. She left the stage.